Ahhhhh, good ol' Newbury Street. For all our non-Bostonian friends out there, Newbury Street is kind of like.... ummm.... well, it's kind of like Newbury Street actually, I can't really think of any other street like it, though in my non-descript defense, it's not like I've been to a ton of other cities. How can I describe it? It's just an awesome street lined with awesome shops. It's the old school Bostonian version of a street that probably exists in every great city, though we've been around awhile so we do it a little different. Where as a typical main street would have street level stores, Newbury goes with the split level approach. Alot of the time you can either go down a half flight of stairs to the basement store or take a half flight up to the first floor store. It's just a cool way to fit everything together. 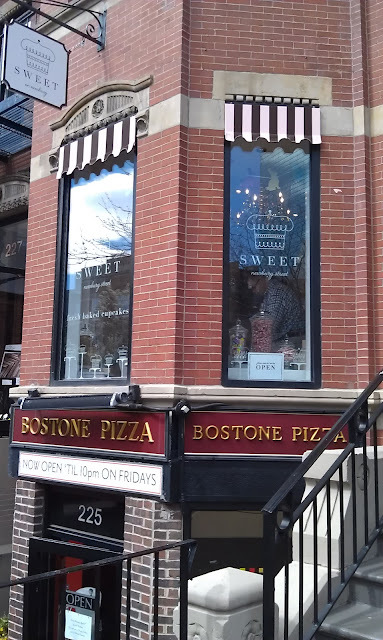 So, Newbury St is blocks and blocks of stores and food. Clothing stores, knick knack stores, all kinds of neat restaurants (many of them open air), just all kinds of great stuff. On one end is the intersection with Mass Ave where a Tower Records once stood. 8 blocks to the east and you'll be in the Public Garden (with our infamous swan boats). If you are ever in the city, I recommend it as a nice walk... just do me a favor and try not to get run over. Our day wasn't going quite as planned (i.e. 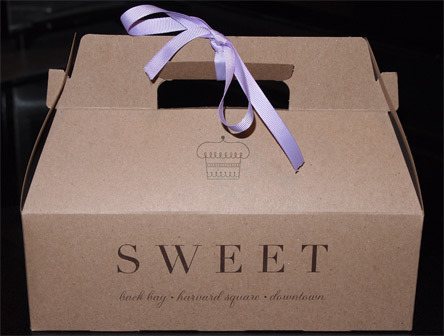 total messed up), so my wife throws out that she's heard that SWEET has some of the best cupcakes in the city. That's a pretty bold statement and demands some investigating. We leave the Pru and head on over towards Newbury Street. It doesn't take us long to find our neat looking goal. We enter a small shop that is mostly white, a few small tables, a big TV on the wall, and most importantly : A display case full of some very tasty looking cupcakes. Like many of the customers there, we have no idea what to get. Thankfully, the staff was all smiles and patience. We took our time and eventually wound up going with a four pack to take with us - it's like $3.25 a cupcake or 4 for $12.50 (I think). You can also do a half dozen or dozen if you want. Mmmmmm, a simple box with a complimentary bow, I like it. I bet two things strike you right off the bat. One, it's a average size cupcake, just like the ones you make at home. Two, It's a dollup of whipcream, and not a covering like you might find somewhere else. I think you still get the same overall volume of frosting, so it's more of just a styling preference. Now these first two you see were my choices, though the idea here is to split them with my wife. 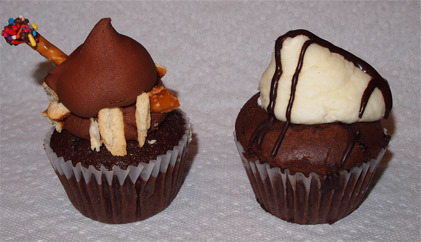 On the right we have a CHOCOLATE COVERED PRETZEL cupcake. It's a chocolate cupcake, chocolate buttercream frosting, and then some smashed pretzel rods for decoration. The cupcake is fairly typical, the frosting is this superb light and fluffy, super sugary conconction, and then the pretzels don't add as much as I had hoped. I adore pretzels, so I would have dug some more crunch in every bite (maybe some smaller crumbs mixed in with the big ones). Now we couldn't go home without something for my daughter. They had a whole bunch of cute Easter themed cupcakes, but the funnest looking one is by far the PEEPS cupcake. It's a vanilla cupcake with two different buttercream frostings and then a peep on top. I love how the one layer of frosting matches the peep, that's just pure optical fun. We got home and my daughter dug in, but surprisingly she didn't finish. There's still a chunk of cupcake top left, so I give it a shot. Weird, the base cupcake seems flavorless yet the frosting is oh so potent. On one hand, it makes the 5 year old in me sing at how crazy sugary good the frosting is. On the other hand, it makes older me feel a little dizzy from the sugar high. WOOOOOOOO. Ok, I see why she stopped. 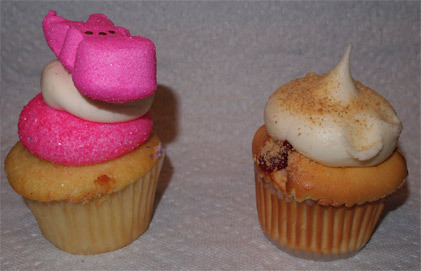 Our last cupcake (on the right) is the CHERRY CHEESECAKE cupcake. It's a cream cheese cupcake with cream cheese frosting inside and out, a graham cracker crust bottom (so cool!) and then it's dusted with graham cracker crust. My wife gives the thumbs up to this one and I'll admit to sneaking a little of the frosting which was indeed cheesy (and awesome like the other frostings). So overall this place was cool. I like the decor and the cupcake holding ferris wheel was pretty awesome. Unfortunately I can't give a ringing endorsement since there seemed to be a few stumbles along the way. Hey, you know me, I'm super critical. To be honest, if we were walking down Newbury Street again, I know we would totally go back in and try some other seasonal flavors. Ok, stay tuned for Part 2 where we go and get ourselves some ice cream. Very enjoyable post! Timely as well for me as I'm currently watching "Cupcake Wars" on Food Network. Makes me want a cupcake. Glad you enjoyed Newbury Street. I was there many years ago and enjoyed it as well.